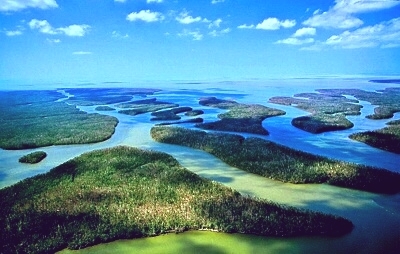 Everglades National Park protects 25 percent of the original Everglades wetlands in southern Florida. The third largest national park in the contiguous United States, the Everglades are the only subtropical wilderness in the country. The park is an intricate network of rivers and wetlands that houses a beautiful yet fragile ecosystem. Even though the Everglades are wetlands, there are still many trails to hike. The Flamingo and Pine Islands trails are popular, and are easily accessible from the park’s main entrance. One of the most popular Flamingo trails is Anhinga Trail, an excellent trail for spotting various wildlife species. Alligators, American crocodiles, turtles, anhingas, herons and other birds are common sights, especially during the winter months when the water levels are low. Don’t miss the Pahayokee Overlook, an observation platform that provides amazing views of the “river of grass” or the Shark River Slough, one of the main water flow channels in the park. The slough brings water all the way to the Florida Bay and into the Gulf of Mexico. Some have compared it to looking at the grasslands of Kenya, so don’t be surprised if it feels like you are in another world. Another great stop is the Mahogany Hammock, which takes visitors through jungle-like hardwood “hammock.” In addition to being the home of the largest living Mahogany tree in the U.S., the hardwood hammocks are also home to the few Florida panthers in the Everglades. Boating is another favorite pastime of many park goers, though it is advised that boaters be extremely knowledgeable of the terrain before setting sail. Park waters can be very shallow; visitors should be wary of mud, seagrass, oyster reefs and sandbars. The park charges a boat launching fee to every vehicle that enters the park with a boat, canoe or kayak. The park has two seasons: wet and dry. The dry season, or winter, is the park’s busiest season, and visitors are encourage to book tours, lodging and campsites in advance. The dry season provides pleasant, mild temperatures with highs in the 70s. Many ranger-led programs are offered. During the wet season (summer), access to the all of the park’s facilities is limited. Temperatures average about 90 degrees and humidity can be as high as 90 percent. Wildlife viewing is also limited due to animals dispersing when the water levels are higher. The park charges a $10 entrance fee for all vehicles, or $5 per person. The fee grants seven-day access to the park. Campsites range from $16 to $30 a night for all frontcountry sites. Backcountry sites require a special $10 permit, and can only be issued 24 hours in advance. More than 350 species of birds have been sighted in the park, including the great white heron, great egret, and the colorful roseate spoonbill. Bird populations declined during the 20th century as a result of urbanization and the plume trade. Through national park efforts, bird populations have been on the rise again. The Everglades region has been inhabited for at least 10,000 years, but it was the arrival of European settlers in the 1900s that really made the first impact on the region. The population of southern Florida was growing, and as a solution, developers concocted an Everglades drainage plan. From 1905 to 1910, much of the Everglades were drained to make the land more agriculturally sustainable. The notion of “new land” helped the population grow. As more people moved to Miami, Fort Lauderdale and Fort Meyers, more shorelines were destroyed, and more roads, canals and buildings were constructed. Early conservationists knew that development was impacting the land in a negative way, destroying the forest’s delicate ecosystem. In 1916, Royal Palm State Park was established, but only included a few trails. Supporters of the park wanted the area protected on a federal level, so in 1923, they proposed that the area be established as a national park. 1948 – Congress authorizes the Central and South Florida Project, building elaborate roads, canals, levees and water-control systems. The project provides many benefits, but severely impacts the natural environment. 1972 – A bill is passed to curb development in South Florida. 1976 – The park is deemed an International Biosphere Reserve. 1979 – The park is listed as a UNESCO World Heritage Site. 1987 – The park is recognized as a Wetland of International Importance. 1989 – President George H. W. Bush signs the Everglades National Park Protection and Expansion Act, adding more than 100,000 acres to the park. 1993 – The park is placed on the List of World Heritage in Danger. 2000 – Congress approves a restoration plan called the Comprehensive Everglades Restoration Plan. Click to see a detailed Everglades National Park map.